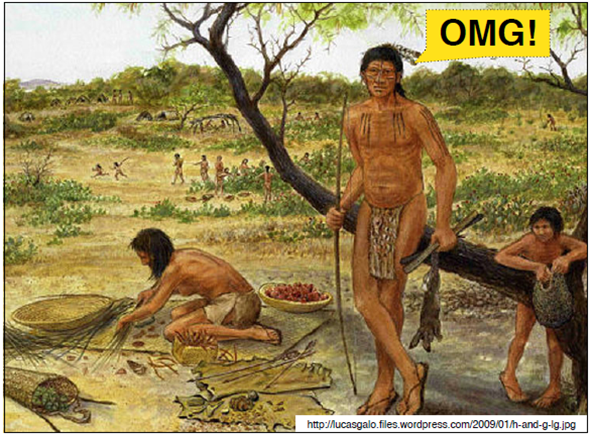 Social networking is as old as humanity, and even the term social media has been around for quite a while. But as a function within marketing, social media management is only 3 years old at best for the majority of organizations. Despite all this, many B2B marketing organizations are seeing huge growth in the number of channels their business is demanding. And as the channels grow like weeds in a field, they become harder and harder to control, maintain and nurture. In fact, channel proliferation might be overwhelming the good, customer-centric, buyer-controlled marketing you are trying to encourage. And that’s why, for many marketers, your social media marketing stinks! According to research from the Altimeter Group, companies with greater than 1,000 employees are averaging 178 total social media accounts across the wide spectrum of channel possibilities. 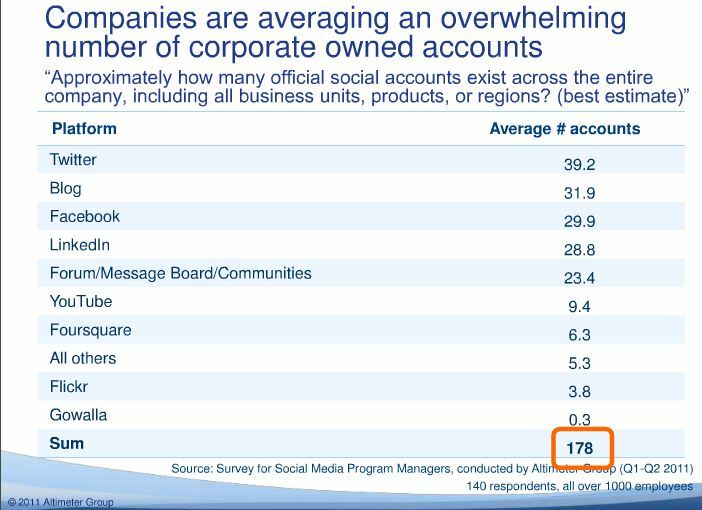 That includes an average of 39 Twitter accounts, 29 Facebook accounts and 28 Linkedin accounts. This is on top of 32 blogs, 23 community spaces and 9 YouTube accounts. Altimeter suggests that companies are falling into a cycle of social sanitation (managing crap?) and forcing social media marketers into the role of a compliance teams. When instead, social media marketers should be driving employee adoption of customer engagement practices that drive business results! Altimeter’s recommendation is for B2B marketers to climb a “social hierarchy of needs.” They suggest the path to reach “Social Enlightenment” starts with policies and frameworks but needs to evolve to a dedicated team prepared for workflows and crisis management, followed by a center of excellence, empowerment and a holistic social business environment. I think there’s a good reason for the sorry state of social media marketing in many B2B companies: someone told marketers to go get a branded twitter account (followed by Facebook and LinkedIn and YouTube and a blog) for each region, line of business, portfolio and product. It is likely that many of them had no objectives behind them. And regions, lines of business, portfolios and products only line up to internal structures, not to customers. So it starts with marketers who make the biggest marketing mistake of all: they make it all about them and not about the customer. They focus on activities instead of results and end up with dead-end accounts with no reach or engagement. But I also still believe part of the problem is that B2B Marketers need to truly wake up and get social themselves. Once you start blogging and tweeting and interacting with real customers yourself, you quickly learn that registration forms are the death of any social content. That blatant promotion is the quickest way to get blacklisted. That offering no real value actually hurts your brand. And that understanding customers, offering them something of value and engaging with them regularly is the most satisfying marketing you can do. Better yet, each and every marketer, regardless of title or position, can participate and reap the rewards and personal satisfaction of meeting customer needs. Marketers who do social, get social and can provide leadership to those who don’t! Start with a governance policy that requires certain criteria are met before any new branded social media accounts are opened. Criteria can include identifying why existing channels cannot support the need, commitment of resources and regular updates, a unique content focus and adherence to standards. Weed out the non-conformers. 178 accounts is way too much for any business. I wonder if you need 17. Languages and major portfolios with vastly different target audiences may account for some but there has to be a limit. Show the value of a coordinated approach. Higher quantity AND quality of activity will drive higher reach and engagement. This will result in more followers, fans and likes and more conversions later in the buying process. In the end, it takes simple leadership to defend the customer-first approach and show how putting their needs first drives higher engagement, more reach, better conversions, more customers, more loyalty and happier employees. Below are the slides from Altimeter that inspired this post and thanks to Jeremiah Owyang (@jowyang) and Altimeter for his continued work in the social CRM and social media marketing space. Disclosure: SAP is a client of Altimeter. Hmmm, let’s try that again! Whenever business people start talking about Maslow or Maslow-like things, you know that the ship hit something and it’s taking on water fast. Maslow’s pyramid scheme was a poor reflection on a broken Darwinian model that does bear out in nature. I agree with the reasons responsible for a stink in the Social Media Marketing. The marketing strategies are not consistent and this is considered to be the main reason.